I'm trying to decide whether or not to continue posting my photos on Blogger or not. This weekend I spent some time culling over 400 photos I took on September 23rd. The Fall Equinox is a day I try to set aside to indulge my little hobby. I've lucked out with the weather the past few years and this past Wednesday was no exception. I decided to post my photos on Flickr this year. It seems a bit safer than Blogger and Facebook. If you have other information, let me know. In the meantime, here's one photo, and you can click here to get to my album on Flickr. I was driving down Abbott Street Saturday and decided to avoid Pandosy Village, via Walnut Street. 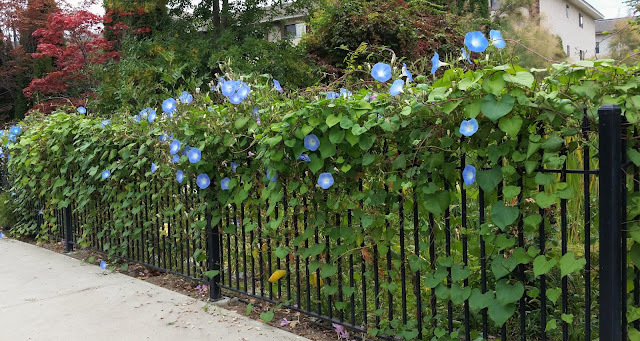 As I approached the stop sign at Watt Road, a profusion of morning glories caught my eye. I thought about stopping for a photo but there was a line of cars parked in front of them. I thought about coming back Sunday morning, but on impulse I decided to take a page from Reg's book: The time to do the thing is now; you never know what the future will bring. I snapped a quick couple of photos with my smart phone, thinking I might come back the next day with the 'good' camera. The more photos I took, the more photos I was compelled to take. The gardens that surround the Palisade Apartments at the corner of Walnut and Watt are stunning. One hundred and forty three photos later.... thought I'd share a few. Every year when September arrives our local radio personalities and Facebook Kelownites start to complain. "Summer is over," they whine. "It's so cold/rainy/grey," they moan. I'll never understand people and their short memories when it comes to weather. These are mostly people who have lived in Kelowna for years. They seem to forget that this is how September begins in the Okanagan and by the second week can count on brilliant blue skies with golden afternoons in the mid to high twenties.